Note that the very first deliveries of the Luchs were to 9.Pz.Div. Yes, there are 8 ridges on the roadwheels, not 7 as seen in the first images that appeared on the CAD drawings before the actual release. It's comforting to know that Flyhawk reacted to this mistake, which had vexed many modelers. Smaller parts, hull and turret. 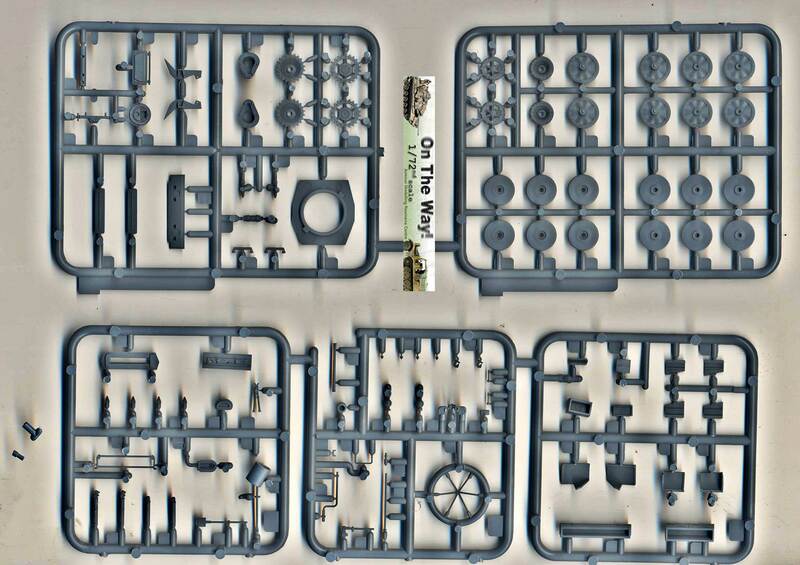 Sprue I (on the left) is somewhat of a mystery, as only two of the three jerrycans are needed, yet it contains some specific parts that aren't yet found in other Flyhawk kits. Decals. 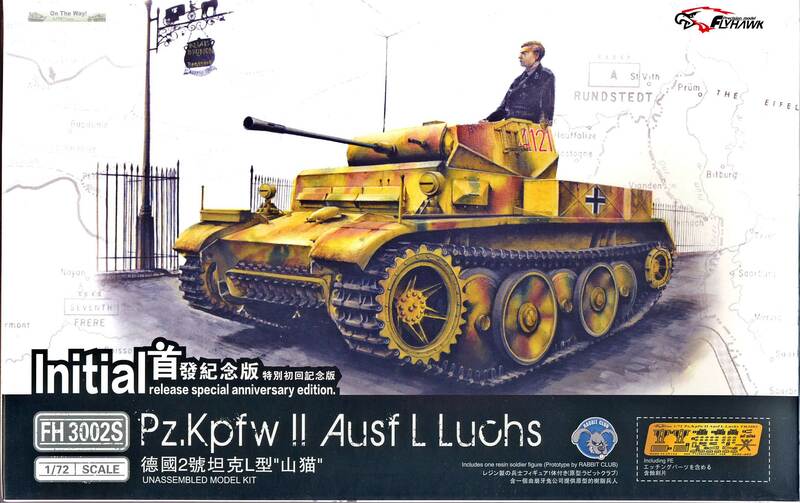 Clearly meant for both this kit and the forthcoming second boxing of the Luchs. Instructions. Again different colors are used to ease interpretation. 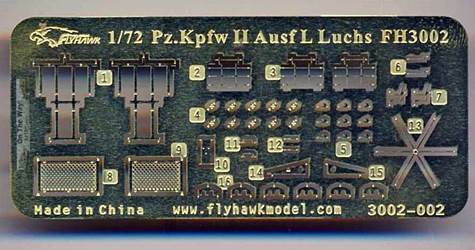 Modelers familiar with previous releases from Flyhawk will immediately feel at home. A small cardboard base. Unfortunately this also doubles as a packaging support for the PE and decals and gets punctured by a staple for that reason. An additional resin figure in its own small box. This is apparently from "Rabbit Club". I haven't found much info about them, except a Facebook page. Note that the packaging that we have been used to from Flyhawk (sturdy box, with foam padding to keep all the sprues in place, has been replaced by a typical top opening box with individual plastic bags for each sprue. Perhaps that was the reason some parts were broken off the sprue (but not lost, thanks to the bags). In this step we assemble the main hull parts. Fit is exquisite and many parts will stay in position even without glue, even though using some might be safer. The only place where I needed to intervene mechanically was the front plate (the one that holds the drivers' visors). Here I beveled the inner edges of the receiving end (the upper hull) a bit to allow for an easier fit as I had decided to glue the upper hull to the lower hull before adding the front plate. Following another sequence might give different results, however. One of the axles for the roadwheels was broken off in my sample, possibly a consequence of the slightly lower packaging standards Flyhawk has turned to. The modeler is required to shave off two small squares on the nose. I am not quite sure why they were there in the first place. Eight PE lifting hooks can be prepared in this step (watch for the green "1" in various steps), but I think I will go for the plastic parts that are cast on the hull and turret or otherwise I will need to spend a fortune on tranquilizers afterwards. The mere idea of replacing the handles on the hull hatches with the PE parts already gave me cold sweat, but I am sure some of you will get their kicks out of this. Whatever your fetish, Flyhawk must be recommended for at least offering the possibilities. Something that I applaud without hesitation, however, is the possibility to have functioning driver's visors. This is the first time I've seen this in 1/72 scale and I am very much impressed. If only all manufacturers took a leaf out of this book ! To avoid losing them, I left them off at this stage. I decided to only fit the rear hull plate and leave the muffler, towing pintle and PE for later for the same reason. 1. Before adding the rear hull plate you would probably like to dab some paint on the interior of the hull. 2. I only discovered very late in my construction sequence that the two small notches on the upper corners of the front plate need to be filled in. Perhaps these are meant for a forthcoming version. I left off the idler arms, as I believe this will give me a bit more margin to play with when I fit the link and length tracks. I also left the jack, spare tracks and headlights for later. Note that a PE part is given for the electrical cable going to the headlights !!! It is at this stage that I realized that the plastic in the kit reacts very well to my favorite glue, MEK. Perhaps better than I had anticipated, as I managed to damage some detail on the shock absorber guards. We now get to the sprocket, wheels and idler, plus some stowage. Contrary to a recent trend in kits with interleaved suspension, the wheels are all individual. This has the advantage that you can position them as you like. Kits with an arch connecting the wheels invariable suffer from having all the wheels at exactly the same position. The way the suspension arms are engineered, it is also fairly easy to set them in a different position in order to have the suspension conform to the terrain. The disadvantage, of course, is that individual wheels are more tedious to install and require extra attention to ensure perfect alignment. Regarding the suspension, I have not found any particular reason why parts that look identical to me are labeled differently (e.g. parts L-9 and L-10). The outer halves of the idlers are very difficult to clean up after removal from the sprue, with multiple sprue gates very close to intricate detail. Before fitting the toolboxes, I sprayed some dark brown over most of the tank, to be sure I got a coat of paint between the hull and other parts, like the boxes. I did not fit the box on the right front fender (M-4) as it is not seen in pictures of the vehicle in the marking options. It can be seen on other vehicles though. Looking at pictures, it also seems that some units replaced the long box on the right fender (M-11) by another arrangement. As a matter of fact, exterior stowage of the Luchs varied quite a bit, even though only 100 vehicles were built. Looking at the tools, I noticed that  shows the presence of a starter crank (part N-12), while  doesn't. As I have the impression that the crank is given in mirror image (with respect to its latches), I left it off. The axe (part N-13) also seemingly suffers from this defect, which can be solved by cutting off the clamps and turning them around. The wrecking bar (O-9) won't easily fit over the small fender support. I decided to shorten the part slightly and make it fit between the fender support and toolbox M-10. Not entirely correct, but much more convincing than a semi-floating crowbar. Did I tell you that it might be a good idea not the glue the drive sprocket together just yet ? No, I don't think so. Well, if you can't resists, use as little glue as possible. When installing the tracks it might become clear why. Feeling a bit more comfortable that smaller pieces now had a chance of staying on the kit during handling, I added more of the details that I had left off previously. PE parts 2, 3 and 16 were added using varnish. This is not as sturdy as (super)glue, but (I hope) it will do the trick. These parts normally do not need to withstand any stress and I was afraid that I never would be able to apply superglue sparingly enough. A bar from PE-3 broke off during handling, which is not surprising given the size of these things. As pictures of this particular vehicle show it in a sorry state, I guessed it went with the theme. I also decided to fill in the three holes in the rear plate that need filling. I should probably have done that before installing the plate in the first place, but the whole deal left me puzzled as to why these holes are there in the first place. First of all, they serve no particular purpose and if ever they are needed for another variant of this kit, then drilling out holes that you need (from the inside) is a much easier solution than filling in holes that you don't. The spare tracks on the nose were also fitted at this point. I managed to destroy some bolts on the frame (O-8) as I mistook them for sprue gates. In my opinion it is best to clean up said part after adding the tracks to it, as this will add rigidity to an otherwise very delicate part. I noticed too late that there is a front and a back to part O-8. The back has minute slots that will fit onto brackets on the nose. 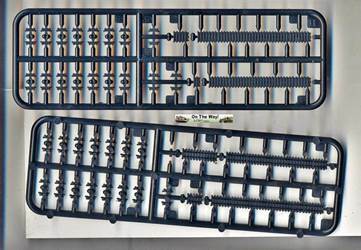 I noticed that some links in the track section (G-3) are slightly out of line, in particular those where the sprue gates give out on. Having added these parts to the kit, I decided to keep others for later yet again. The rear mudflaps (parts M-8 and M-9) were added to the kit (without some of the tools and other detail). 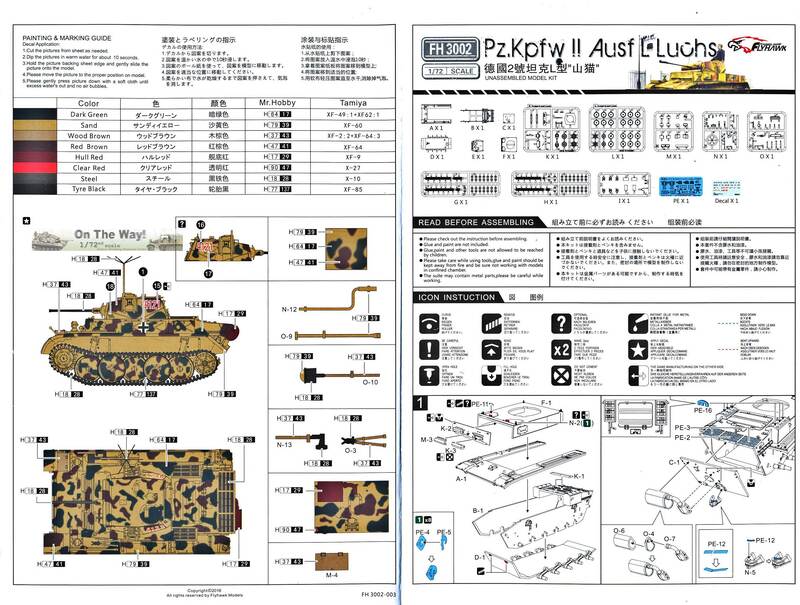 Note that Flyhawk caught a tiny detail of the Luchs: the stiffeners (PE-14 and 15) are installed slightly different between left and right side. 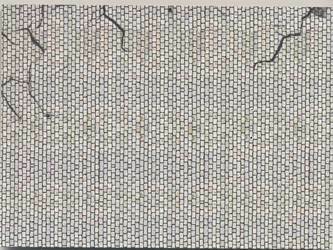 It is very easy to miss this in the instructions if your brain is primed for symmetry. I found it rather difficult to judge the angle at which these mudflaps needed to be installed, as there is nothing in the kit that would stop you from adding a few degrees more in either direction. I eyeballed them based on drawings in . Note that the front fenders were easily lost in combat. Pictures of the vehicle in the marking options show it in a particularly battered state, without front mudflaps, headlights, mufflers, etc. I decided not to fit the fire extinguisher (K-5) to the right mudflap as it is not shown in any of the pictures of Luchses that I have, or in the drawings of  and . The Luchs used Kgs 63/360/90 tracks, which were 360mm wide (as the name suggests). In this case, we do not need to worry about the difference between the width of a link and that of the track pin, as the pins were recessed. 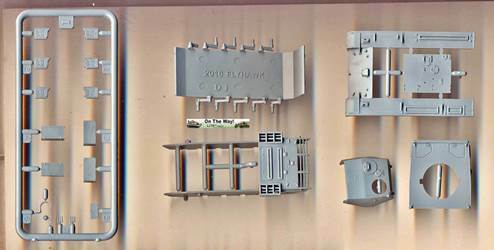 A link was 123mm wide, but what is more useful to us modelers is the pitch (distance between two track pins), which is 90mm, as again indicated by the name of the track. Guide horns were solid. The tracks in the kit are 5mm wide (exactly 360 scale mm) and have a pitch of 91 scale mm, which seems to be well within measuring tolerance. Detail matches the real thing, but not perfectly. The ribs on the track "tabs" were slightly angled on the real vehicle (appearing as "V"s), while they are parallel in the kit, but that's a minor gripe. Unfortunately, quite a bit of this detail might be lost during assembly (of which more in an instant) as the plastic reacts extremely well to glue, with all the accompanying risk of melting detail. The pictures of the Luchs that I had available for this review show two different ways to install the tracks. (It's not uncommon for German tanks to have the tracks installed "backwards"; it was even sometimes done at the factory.) 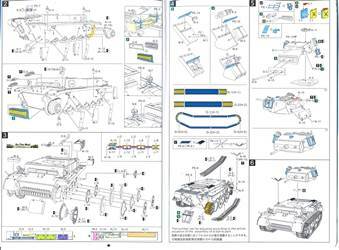 The most common way corresponds to the instructions in the kit, which, incidentally, is different from that in the drawings in . Either the sprockets are too narrow, or they shrank a bit due to the action of the glue between the two halves. Whatever the cause, I ended up separating the two sprocket halves again, which, with care, was ok as I had used little glue. I then spaced them apart based on the actual width of a track link. Even if you don't encounter the problem mentioned above, it is very easy to very slightly misalign both sprocket halves as there is just enough play in the locating pegs (which soften due to the glue) to do this. If you don't align the teeth of both halves absolutely perfectly, you will end up with a crooked track, in a place where it really shows. Again the track tabs need to be removed. I am still pleased with the end result, but it took mare time, care and perseverance than I had anticipated. A nice touch is that Flyhawk prepared the longer track sections for bending, by leaving a small gap where the fold needs to go. 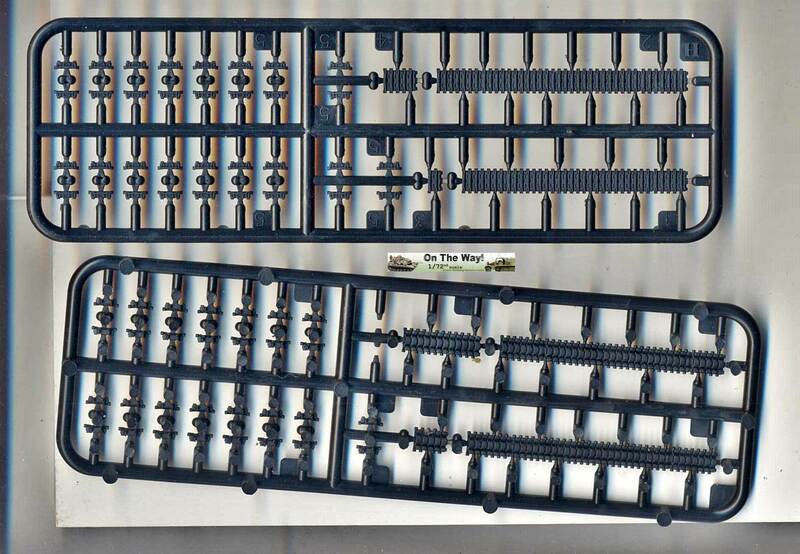 Note that you end up with a few spare tracks (which is not a luxury as the small individual track links are easily damaged) and even sections of track, which is more surprising and would confirm my suspicion that these tracks (together with sprue I) will, in the future, also be used for another kit that has yet to be announced. The last remaining bits were added. I only experienced trouble with the visors. The movable sections seemed too narrow, so I sliced 0.1mm off from the sides of the visor parts that were on the front plate. Even then, I could make them to fit without using glue. It's also advisable to install the center (fake) visor after the outer (real) visors. 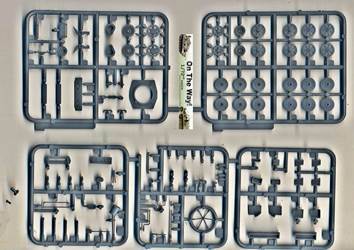 The width indicators were rebuilt from scratch (stretched sprue and blobs of white glue). The kit parts (N-3) are very fine, but also very delicate. There is also a tiny seam line, which proved nigh impossible to remove. The handle on the towing pintle (PE-12) is provided twice, which allowed me to lose it twice. It was replaced with some stretched sprue in the end. Even though the commander's hatch really is too detailed on the inside to stay shut (apart from the rather large ejector hole), I wanted to use the figure supplied in the kit. This figure has a pose that requires it to be put in on open rear hatch (which also has detail on the inside). As the commander's hatch would thus allow anyone to peek into the turret and as I didn't want to add any scratchbuilt interior, I glued the hatch shut, much to my dismay. Probably due to the tears that were welling up in my eyes, I didn't notice two minor sink marks on the outside of the hatch. Not being sure how I could best get rid of them after installation, I left them be. The plastic lifting hooks (N-2) are among the tiniest parts I ever installed. I am quite sure one of my fellow reviewers would call them "right puny". A high quality pair of tweezers is definitely needed when installing them, but it can be done. I am not sure how I would have handled the PE alternatives, however. I managed to break one off when manipulating the turret later. Fortunately, the carpet monster was fast asleep, so I found it back, which is a feat in itself given the size of these things. In hindsight, I wouldn't have minded if Flyhawk had given us some spares. While the kit 2cm barrel (N-8) is nicely rendered and comes with a hollow muzzle, it was replaced. Again the seam line bothered me; with a part this thin, even the slightest deviation from circular symmetry would show. (I can't remember where the replacement brass barrel came from, though.) I could have replaced the coax MG with one of the brass offerings from Aber, but I decided to just drill out the muzzle of the plastic kit part. Note that an antenna needs to be attached to the left rear corner of the turret, which is not mentioned in the instructions. No part for it is provided, which is not really an issue as any attemp would probably be far too clunky. (I already find the hull antenna a bit oversized.) Stretched sprue, piano wire or any other alternative will do fine, you just have to not forget about it (unless you assume it wasn't fitted for the occasion on the vehicle you are representing, of course). As a last step, I added tiny blocks of clear sprue, cut to shape, to the inside of the turret periscopes. Another feature, that I was unable to put a date on, is a base for an antenna on the left of the turret that appeared at some time, possibly together with the larger hatch. It is present in the kit. I've marked the kit features in bold. 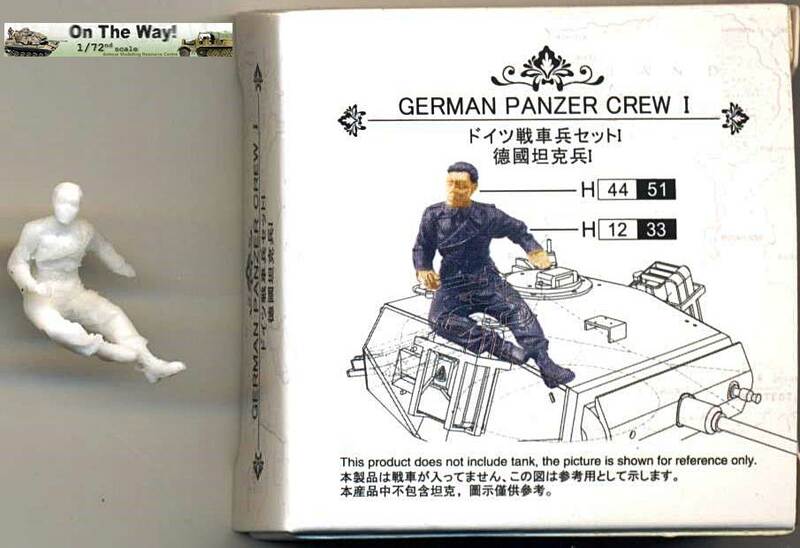 As can be seen, there are some inconsistencies if the kit is built according to the instructions. The easiest way to get a consistent vehicle would be to plug the driver's periscopes and get a July 1943 vehicle. As can be seen above, other options would be equally simple if one stays in the post December 1942 time-frame. It is worth pointing out that the vehicle given as the sole decal option is actually a hybrid vehicle that has some inconsistent features itself. More about that below. the bottom plate, which is overscale. This is hardly noticeable given its position, but the length which is closer to 1/70.5 might attract attention to the well trained eye. I cannot say I would have noticed without measuring the kit. the drive sprocket, idler and roadwheels, which are underscale. I also looked at the accuracy of the details. 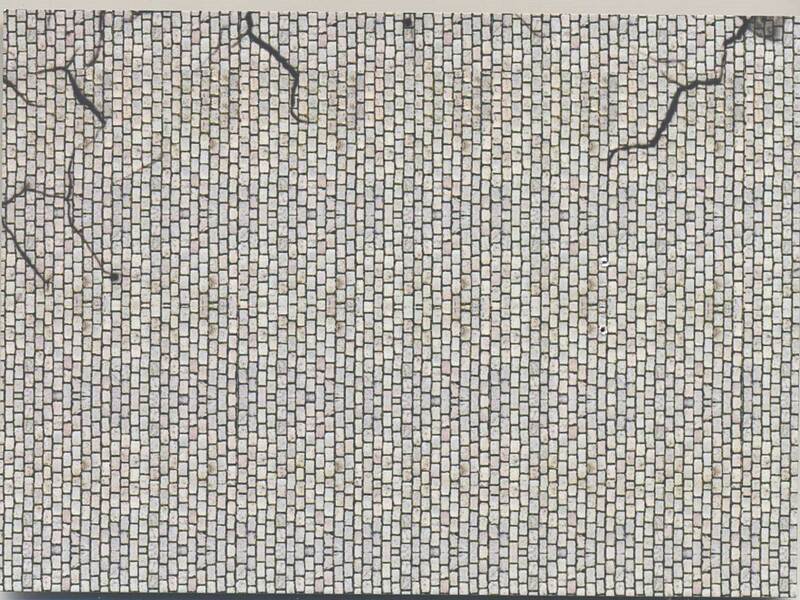 All the features of the lower hull exactly match drawings in . The protectors of the shock absorbers are a very nice feature, which most manufacturers would probably just render as a raised box, instead of the stand-off panel. Admittedly, unless you build the vehicle with missing pieces or in an unorthodox position, it is impossible to tell that there is space behind the plates. The same can be said of the upper hull, which is again an almost perfect match with  (unless I am missing something). A feature of the Luchs that is easily overlooked is the difference in size between the left and right vent (to the sides of the engine deck). The left one is slightly (but noticeably) smaller than the right one, and Flyhawk is to be recommended for not being fooled. Flyhawk gives only one marking options this time, in typical three-color camo. The instructions don't tell you what unit it belongs to, but the side of the box tells us that this type with "wide rear escape hatch, and no smoke grenade launchers [...] is the type used by the German 9th Armored Reconnaissance Battalion during the Normandy Campaign of 1944". This would be somewhat strange, as my sources would make me believe that the wide hatch would be a late type, while the boxtop says "initial". 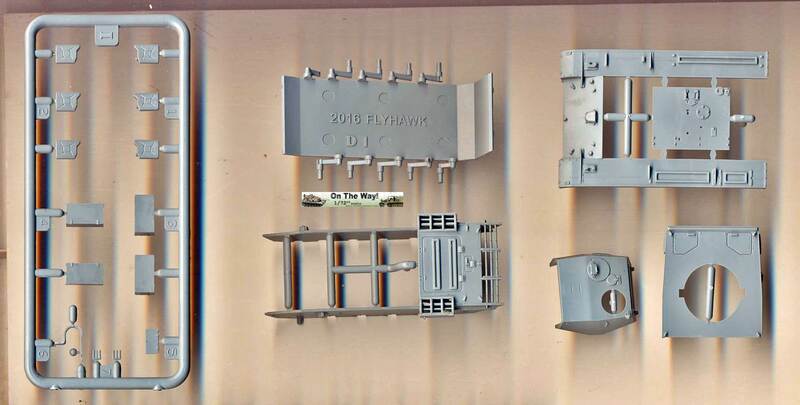 After some research, mainly using  it became clear that the boxtop designation "initial" wasn't perhaps the best choice, but that Flyhawk isn't far off the mark when it comes to the kit itself. Vehicle 4121 is well-photographed, but this doesn't mean it is any less enigmatic. All known photographs are taken after capture. claims it was issued to 1.Kp./Pz.Aufkl.Abt.9, i.e. 9 Pz.Div, while  claims it was used by 116 Pz.Div. This internet thread claims that it was from 116 Pz.Div, but that the turret number was changed from 4114 into 4121 after it was captured and repainted. So, while we may be unsure who the vehicle belonged to, or who applied the paint, it is clear which vehicle Flyhawk is showing us in the manual. (Perhaps that is also why Flyhawk doesn't tell us which unit the vehicle belonged to.) This vehicle (FgstNr 200164, Turm Nr 200143) is a hybrid, in the sense that it was built in July/August 1943 and rebuilt afterwards. It has the late, wider turret rear hatch (so this is correct), but the early commander's hatch and no base for the Orterskompass. It also lacks the smoke dischargers on the turret, which is again a similarity between the real vehicle and the kit. Flyhawk gives the late commander's hatch (small difference, but difficult to remedy) and a PE base for the Kompass. Leaving the latter off is rather easy. As far as I have found, the Luchs in Normandy were only from the 9. PzDiv. 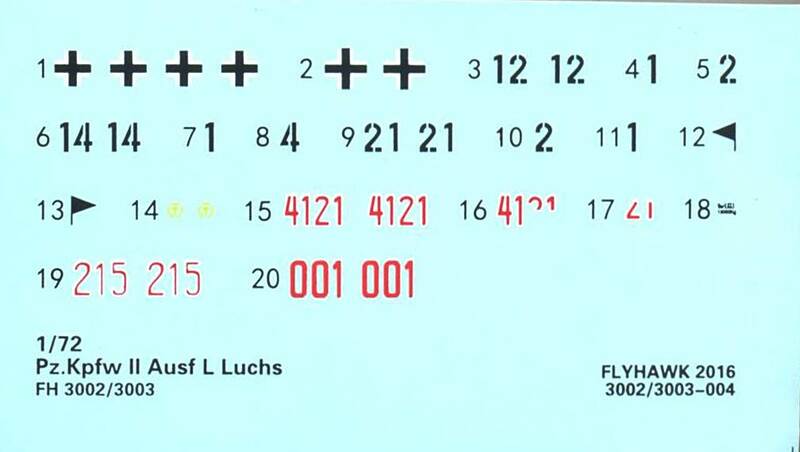 The four digit number was typical of the 9. PzDiv: the first number indicated the Battalion within the Division (the Panzer Aufklarung Abteilung was the fourth). The next three numbers followed the normal numbering system (Company-Platoon-Individual vehicle). 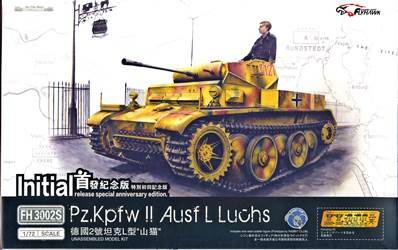 The Luchs were in the 1. Panzerspähkompanie (26 tanks in July, 18 in September). Pz. Aufkl. Abt. 9 was based on the 1944 model, so it had only four companies (the second was equipped with the SdKfz 250, the third and fourth with Sdkfz 251). Vehicle 4121 would thus almost certainly be a vehicle of the first company of Pz. Aufkl. Abt. 9, first vehicle of the second platoon. The Pz. Aufkl. Abt. 116 was based on the 1944 model too, but its 1. Kompanie was equipped with Sdkfz 250/9. Both Abteilungen received the Sdkfz 234/1 and /3 for their Stab Späh section in July to be added to the usual Stab vehicles. The figure is very nicely scuplted with convincing anatomy and one of the best facial details I've seen so far. On the downside, it requires quite a bit of clean-up due to a rough molding seem. Apart from the boxtop, the figure is nowhere mentioned. The boxtop gives the modeler the idea of where to put the figure, but is not a very good help when it comes to painting the figure. First of all, the type of tunic that the figure wears, was not produced in black. It should be painted in reed green, or in camouflage colors. (For more detail, see my article on German uniforms.) I also have the impression that the boxtop shows pink Waffenfarbe, while reconnaissance troops mostly wore yellow. 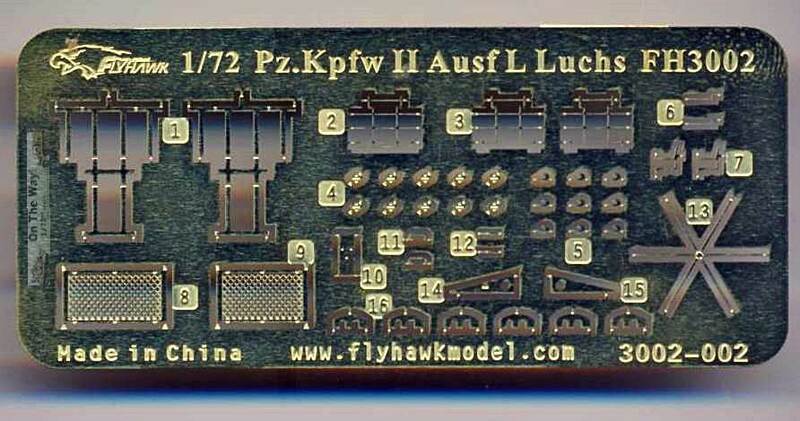 Again an outstanding kit from Flyhawk. Due to the high amount of detail, it does take some skill to assemble. Even though some of the dimensions are off by a few percentage points, the result is undoubtedly the best rendition of this iconic Baby Tiger in 1/72 that is available on the market.